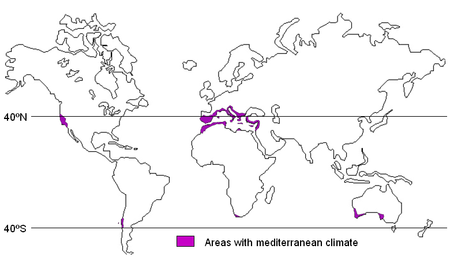 Mediterranean climate types can be found along the west side of continents in mid-latitudes from 30° to 50° N and 30° to 40° S latitudes, commonly in a belt of prevailing westerly winds (Fig. 1). Shrub communities are common in the Mediterranean climate type. In Chile and Spain these Mediterranean shrub communities are called matorral, in France it is called maquis and in Italy, macchia. In South Africa it is known as fynbos and in southwest Australia kwongan. Oak woodland and grasslands also occur in this climate type. Fig. 1. Location of Mediterranean climates. During summer, regions of Mediterranean climate are dominated by subtropical high pressure cells, with dry sinking air capping a surface marine layer of varying humidity and making rainfall impossible or unlikely except for the occasional thunderstorm, while during winter the polar jet stream and associated periodic storms reach into the lower latitudes of the Mediterranean zones, bringing rain, with snow at higher elevations. As a result, areas with this climate receive almost all of their precipitation during their winter season, and may go anywhere from 4 to 6 months during the summer without significant precipitation. These Mediterranean climate types are classified under the Köeppen climate classification system (Kottek et al. 2006) as “Cs.” The “C” stands for warm temperature climates, where the average temperature of the coldest months is 64° F (17.8° C) The “s” stands for a dry season in the summer. In the winter the Mediterranean climate, is mild and moist. During the summer it is very hot and dry. The normal annual temperature range is between 30° and 100° F (-1° and 38° C). Most of this biome only gets about 10-17 inches (25-43 cm). However, rainfall in California ranges from less than 19 inches (25 cm) in southern desert areas to greater than 100 incehs (250 cm) on the north coast. On average foothill oak-woodland precipitation ranges from 15 to 32 inches (38 to 81 cm). Most rain comes in the winter. Winter precipitation is primarily the result of cold fronts that move across the Pacific Northwest and northern California. The frequency of these storms decreases from north to south. Orographic and elevational effects influence the location and distribution of precipitation in the annual rangelands. The Coast Range creates a rainshadow effect on the westside of the Sacramento and San Joaquin Valleys and restricts summer fog intrusion from the Pacific Ocean accentuating the gradient of summer temperatures between the coast and the central valley. Precipitation increases with elevation in the Sierra Nevada and the Coast Range mountains. Soils derived from diverse parent materials and complex topography further contribute to the diversity of the annual rangelands and their productivity (Menke 1989). California’s Mediterranean-type rangelands include the oak-woodlands, annual grasslands and chaparral. According to the California Wildlife Habitat Relationships Database (Mayer and Laudenslayer 1988) there are more than 29 million acres (11.7 million ha) of oak woodlands, annual grasslands and chaparral (Table 1.1). The herbaceous understory of these rangelands is dominated by annual grasses and forbs that invaded California during European colonization. California’s annual rangelands occur in an intermittent ring around the Central Valley and at lower elevations in the coast mountains and foothills (Fig. 2). Fig. 2. Distribution of annual grasslands, oak-woodlands and chaparral that make up California’s annual rangelands. The oak-woodlands form a transition zone between the annual grasslands that surround the agricultural central valley and the mixed coniferous forest at higher elevations. The annual grasslands occur at lower elevations and in lower rainfall zones in this intermittent ring around the valley. There is a transition from annual grasslands to oak-woodlands with increasing elevation and rainfall. Blue oak savanna is often adjacent to the annual grasslands and central valley giving way to woodland types with more tree species and a shrub layer as elevation and rainfall increase. Oak-woodlands in the Coast Range are commonly adjacent to or intermixed with annual grasslands, chaparral or other shrub dominated communities. Oak-woodlands, annual grassland and chaparral communities often occur in a mosaic. Chaparral occurs in several forms in the coastal range and Sierra Nevada Mountains. Sierra Nevada foothill oak-woodlands are dominated by blue oak and interior live oak. Coast Range foothill oak-woodlands are dominated by coast live oak and/or blue oak (Fig. 3). Valley oak and canyon live oak may also occur in these foothill ecosystems. Fig. 3. Blue oak (top), Interior live oak (center) and Coast live oak (bottom) on California’s annual rangelands. Four factors—precipitation, temperature, soil characteristics, and plant residue—largely control forage productivity and seasonal species composition. Precipitation and temperature control the timing and characteristics of four distinct phases of forage growth: break of season, winter growth, rapid spring growth, and peak forage production (George et al. 2001). Management decisions may be guided by these patterns, and as the season progresses patterns become set and the outcome becomes more predictable. The climate of the annual rangelands is Mediterranean, with precipitation falling primarily between October and May, mostly as rain (Fig. 4). The dry season averages 6 months but may range from 2 to 11 months. Precipitation in the annual rangelands decreases from north to south and increases with elevation. Foothill oak-woodlands generally occur at an elevation of 200 to 2300 feet (61 to 700 m). Fig. 4. Precipitation decreases from north to south. In California annual precipitation amounts vary greatly within and between years. Additionally start and end dates of the rainy season are variable. The new fall growing season (break of season) begins when rains start the germination of stored seed (Table 1.2). Young annual plants then grow rapidly if temperatures are warm (60° to 80°F, 15.6° to 26.7°C) but more slowly if cooler temperatures prevail (40° to 50°F, 4.4° to 10°C) (George 1988b). There is little growth during winter when temperatures are low (40°F, 4.4°C) or less. Rapid spring growth commences with warming conditions in late winter or early spring. Rapid growth continues for a short time until soil moisture is exhausted. Peak standing crop occurs at the point when soil moisture limits growth or when plants are mature (Figure 5). Table 2 and Fig. 6 describe an average weather pattern and seven variations that can result in greater or less than average forage production, based on weather and forage production records kept at SJER (George et al. 1988a, 1988b, 1989, 2001). Patterns of slow and rapid fall, winter, and spring growth have been documented since 1980 at the University of California Sierra Foothill Research and Extension Center in Yuba County (Table 1.3). Fig. 5. The growing season starts with the first germinating rains in the fall and ends when soil moisture is depleted at the beginning of the dry season. Break of season follows the first fall rains that exceed 0.5 to 1 inch (1.27 to 2.5 cm) during a 1- week period (Bentley and Talbot 1951). This may occur at any time from September 15 until January 1 (George et al. 1988a). Early false breaks may occur in summer or early fall, but plants that emerge then may not survive until the true break. Taprooted filaree (Erodium spp.) is one of the few exceptions that often survive a false break. The timing of the break dramatically affects forage production because earlier rains usually coincide with warmer temperatures, resulting in rapid fall growth and a longer fall growing season (Fig. 6 A–D). Fig. 6. Range forage production curves (A–H in Table 1.2) showing influences of eight different weather patterns. The winter growth period begins as fall growth slows due to cooling temperatures, shorter days, and lower light levels. Forage growth may be sparse during this period and dry matter losses may occur (Fig. 6 E). Forage production is greater during mild winters (Fig. 6 F). A short winter growth period or none at all may occur if there is a late break of season. Under those circumstances, almost no new growth is apparent in the fall. Rapid spring growth begins with the onset of warming spring temperatures, longer days, and higher light intensities (Fig. 6 G and H). Normally this period begins between February 15 and March 15, when average weekly temperatures exceed 45°F (7.2°C). The length of the rapid spring growth period varies considerably in California, from as little as 1 month in dry southern regions to more than 3 months in wetter coastal regions (Table 2). Peak forage production occurs at the end of rapid spring growth (peak standing crop), which can come as early as April 1 in the southern San Joaquin Valley or as late as May 25 on the north coast. A late date for peak standing crop means adequate rains will be needed in April or early May. The date of peak standing crop on a single site may vary widely across years and according to species composition. In years when filaree dominates, peak standing crop will come earlier than in years of grass dominance. In some years and on some sites, summer-growing annuals contribute significant additional growth. Moisture from summer storms, although not normally important for plant growth, leaches nutrients from standing dry forage (Hart et al. 1932) and may speed decomposition. Standing residue frequently shatters into ground litter, especially where filaree is dominant. Monitoring of range forage production at the San Joaquin Experimental Range (Madera County), and the University of California Sierra Foothill and Hopland Research and Extension Centers has allowed researchers to describe seasonal and annual variation in forage production (Murphy 1970, Pitt and Heady 1978, Pendleton et al. 1983, George et al. 1988a, 1988b, 1989, and 2001 and 2010). In total range forage production has been monitored by University of California and U.S. Department of Agriculture at 26 foothill locations in the Sierra Nevada and Coast Ranges (Table 1.4, Fig. 7, Appendices A-H). Fig. 7. Location of range forage monitoring sites. Range forage production is strongly influenced by the amount and timing of precipitation. For the range livestock producer, a normal year is characterized by near average forage production. High forage yields result from years with early season (November) combined with late season (April) rains (Murphy 1970, Duncan and Woodmansee 1975). 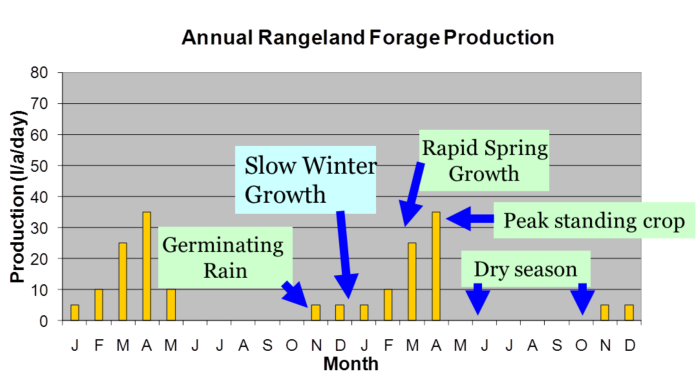 Because 50 to 75 percent of annual rangeland forage production occurs in March and April, spring precipitation has a large influence on total annual forage production. At the San Joaquin Experimental Range in Madera County, California the average annual precipitation since 1935 is 19 in with a range of 9 to 32 inches (48 cm with a range of 23 to 81 cm) and average forage production is about 2260 lb/a (2532 kg/ha) but has ranged from less than 800 lb/a (896 kg/ha) to more than 4500 lb/a (5040 kg/ha) (Fig. 8). While average precipitation often results in average productivity, near average production can also occur in low rainfall years (e.g. 1967-68) or in high rainfall years (e.g. 1955-56, 1940-41, 1957-58, 1994-95 (Fig. 7). Likewise below average precipitation often results in low annual forage production but may result in above average productivity (e.g. 1969-70). This demonstrates that timing of precipitation can have a strong influence on yearly production. Fig. 8. Annual rangeland peak standing crop at San Joaquin Experimental Range (1935–1999). According to tree ring records there have been multi-decade dry periods in the past 500 years. These records reveal a major dry period from 1760 to 1820 (Figure 9, Fritts and Gordon 1980) and another drought from 1860 to 1885. Severe droughts in 1850-1851 and 1862-1864, together with other factors, have been implicated in the conversion of the former native perennial grassland to a grassland dominated by annual grasses and forbs (D’Antonio et al. 2007). Fig. 9. Reconstructed statewide precipitation index (in) for California showing an extended dry period from 1760 to 1830 (Fritts and Gordon 1980). At least eight multiyear periods of low precipitation have occurred in California since 1900. Droughts that exceed three years are uncommon, though occurrences in the past century include 1929-1934, 1947-1950, and 1987-1992. One of the most memorable examples of drought in California was the two year dry period in 1976 and 1977. Precipitation during each of these calendar years, and during the 1976-1977 water year in particular, was extremely low. In these two consecutive years statewide precipitation was ranked among five lowest ever recorded in California. The 1976-1977 drought is notable because of the magnitude of the precipitation deficit and the enormous effect it had on the human population of California. In some years poor precipitation results in forage production that is 50 percent or more below average. Because the amount and dependability of precipitation increases from south to north and with elevation the frequency of years with forage production less than 50 percent of average varies greatly across the state’s Mediterranean-type rangelands. Analysis of annual forage production data from 26 locations in California’s annual rangelands reveal that a 50 percent reduction in range forage production rarely occurs north of Sacramento (George et al. 2010, Appendix A). Forage losses of 50 percent are more common in the rain shadow of the Coast Range adjacent to the west edge of the San Joaquin Valley. California’s annual rangeland forage production also varies greatly over short distances due to variations in precipitation, soil characteristics and topography. The coastal areas of a county may have adequate precipitation but drier inland locations may have low precipitation and forage reductions exceeding 50 percent. Data from San Luis Obispo County reveals that forage reductions of 50 % or more are less frequent at coastal sites than inland sites (George et al. 2010). Bentley, J. R. and M. W. Talbot. 1951. Efficient use of annual plants on cattle ranges in the California foothills. U.S.D.A. Circular No. 370. 52 p.
D’Antonio, C.M., S.J. Bainbridge, C. Kennedy, J.W. Bartolome, and S. Reynolds. 2006. Ecology and restoration of California grasslands with special emphasis on the influence of fire and grazing on native grassland species. A report to the David and Lucille Packard Foundation. University of California, Santa Barbara, CA. Department of Water Resources (DWR). 1993. California’s 1987 – 1992 Drought. Sacramento, CA: Department of Water Resources. 38 pgs. Duncan, D.A. and R.G. Woodmansee. 1975. Forecasting Forage Yield from Precipitation in California's Annual Rangeland. Journal of Range Management, 28: 327-329. Fritts, H.C. and G.A. Gordon. 1980. Annual Precipitation for California since 1600 reconstructed from Western North American tree rings. Sacramento, CA: California Department of Water Resources. 45 pgs. George, M. R., C. A. Raguse, W. J. Clawson, C. B. Wilson, R. Willoughby, N. K. McDougald, D. A. Duncan and A. H. Murphy. 1988. Correlation of degree-days with annual herbage yields and live­stock gains. J. Range Manage. 41:193-197. George, M. R., W. A. Williams, N. K. McDougald, W. J. Clawson and A. H. Murphy. 1989. Predicting peak standing crop on annual range using weather variables. J. Range Manage. 42(6):508-513. George, Mel, Jim Bartolome, Neil McDougald, Mike Connor, Charles Vaughn and Gary Markegard. 2001. Annual Range Forage Production. ANR Publ. 8018, Div. of Agric. And Nat. Res., Univ. of Calif., Oakland, Calif. 9 pgs. George, M.R., R.E. Larsen, N.M. McDougald, C. E. Vaughn, D. K. Flavell, D. M. Dudley, W. E. Frost, K. D. Striby, and L. C. Forero. 2010. Determining Drought on California’s Mediterranean-Type Rangelands: The Noninsured Crop Disaster Assistance Program. Rangelands 32 (3):16-20. Kottek, M., Grieser, J., Beck, C., Rudolf, B., and Rubel, F. 2006. World map of the Koppen-Geiger climate classification updated, Meteorol. Zeitschr., 15: 259–263. Mayer, K.E. and W. F. Laudenslayer. 1988. A Guide to Wildlife Habitats of California. State of California, Resources Agency, Department of Fish and Game, Sacramento, CA. 166 pp. Menke, J.W. 1989. Management Controls on Productivity. In: Hueneke, L.F. and H. Mooney (eds). Grassland Structure and Function: California Annual Grassland. Dordrecht, Netherlands: Kluwer Academic Publishers. Pgs 173-199. Murphy, A.H. 1970. Predicted Forage Yield Based on Fall Precipitation in California Annual Grasslands. Journal of Range Management 23:363-365. Pendleton, D.F. J. W. Menke, W. A. Williams, and R. G. Woodmansee. 1983. Annualgrassland ecosystem model. Hilgardia 51:1–44. Pitt, M. D. and H. F. Heady. 1978. Responses of Annual Vegetation to Temperature and Rainfall Patterns in Northern California. Ecology. 59:336-350. Table 1.2. Influence of normal weather variations on timing of seasonal dry matter (DM) forage production in California's annual rangeland ecosystem. Table 1.3. Germination date, monthly and peak standing crop sinec 1979-80 growing season at the University of California Sierra Foothill Research and Extension Center in Yuba County, California. Table 1.4. Elevation, production, sample size (n), and frequency of forage losses exceeding 50 percent of average forage production at 26 locations in California's annual rangelands. Fig. 4. Figure 4. Precipitation decreases from north to south. Fig. 6. Range forage production curves (A–H in Table 2) showing influences of eight different weather patterns. Fig. 9. Reconstructed statewide precipitation index (in) for California showing an extended dry period from 1760 to 1830.